Note - This is a cold service procedure that must be performed by qualified service personnel. See Cold Service, Replaceable by Authorized Service Personnel for more information about this category of service procedures. Caution - The server must be fully shut down and the power cords disconnected. Caution - This procedure involves handling circuit boards that are extremely sensitive to static electricity. Ensure that you follow ESD preventative practices to avoid damaging the circuit boards. Caution - Components inside the chassis might be hot. Use caution when servicing components inside the chassis. If you have a bus bar from a previous bus bar/power distribution assembly, attach it to the new power distribution board. Lower the bus bar/power distribution board assembly into the chassis. The power distribution board fits over a set of three mushroom standoffs in the floor of the chassis. Slide the power distribution board/bus bar assembly to the right, until it plugs into the connector board. Install one screw to secure the power distribution board to the chassis. Attach the other four screws to secure the power distribution board to the power supply backplane bus bars. Connect the power supply backplane ribbon cable to its plug on the power distribution board. Reconnect the two ribbon cables. 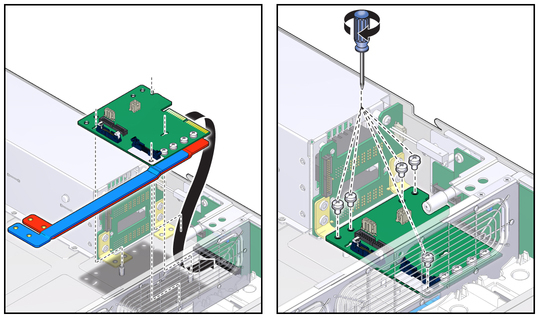 Reconnect the three-pin wire cable from the power supply backplane to the power distribution board. Reconnect the top cover interlock cable to the power distribution board. See Install the Motherboard Assembly. Note - After a new power distribution board is installed and the system is powered on, the chassis serial number and server part number must be programmed into the power distribution board. This operation is performed in a special service mode.